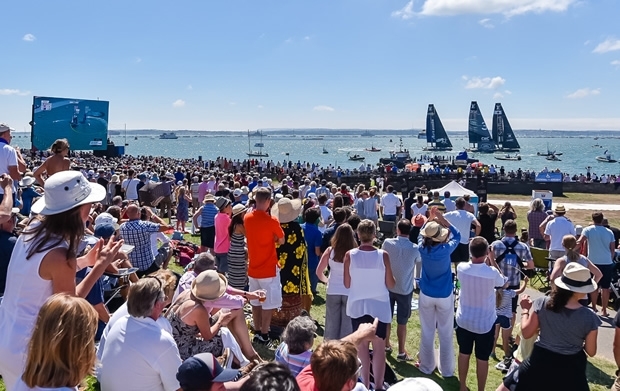 Hot, sunny conditions and thousands of fans lining the Portsmouth seafront was the backdrop to Saturday’s crowd-pleasing Louis Vuitton America’s Cup World Series action, the first day of points scoring races on the Solent at the 2016 event. "We wanted to perform well in front of the home crowd to give them something to cheer for – it’s an extra impetus. We’ve been training hard, preparing thoroughly and the guys are really fired up for it,” said Land Rover BAR skipper Ben Ainslie. “It was very tight racing in quite light and difficult winds. We got caught out in the first race, we were in a strong position and then got stuck with Japan and both of us sailed ourselves to the back of the fleet from second and third which was really frustrating.